I have decided that the Second Edition of Crazier Eights should have a clear theme. It already had multiple characters from the King Arthur stories and I increased the Arthurian theme. 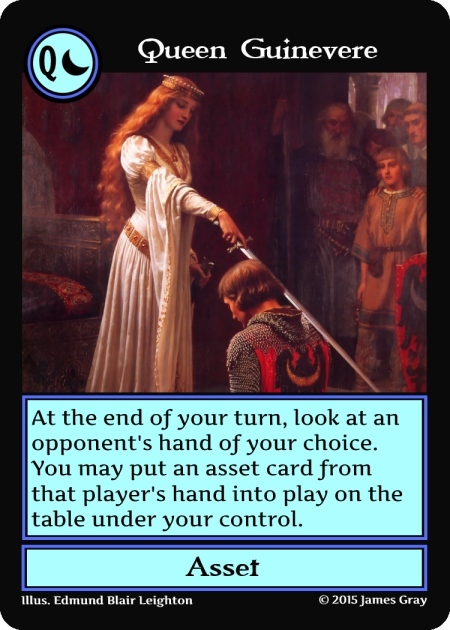 Some of the cards that already had an Arthurian theme have been changed, the card images of some cards have been changed to be more consistent with the Arthurian theme, some cards have been renamed to have an Arthurian theme, and some cards were replaced to have more cards with the Arthurian theme. I am thinking the set could be called Crazier Eights: Camelot, but I will consider other names. Mordred was King Arthur’s greatest enemy. One of the cards was re-named and given a new image to be Mordred. 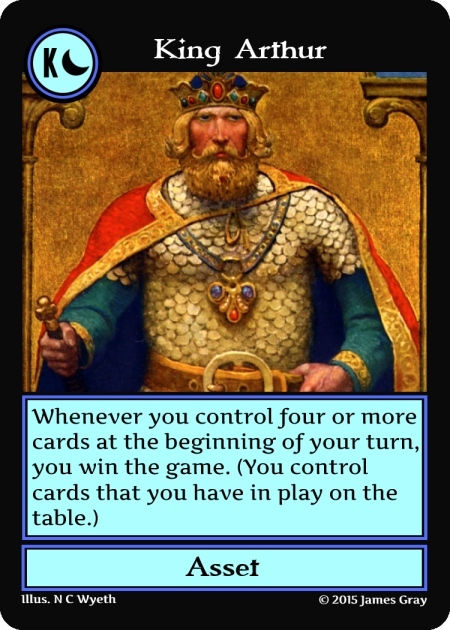 The ability is also one that can defeat King Arthur’s ability, but can’t stop King Arthur’s ability when the player who has King Arthur already controls four cards. Avalon is the magic island King Arthur was taken to in order to be healed. 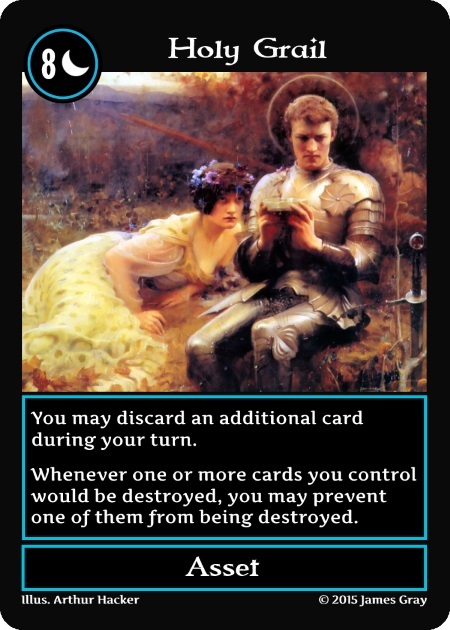 The card still represents the ability of healing insofar as discarding extra cards helps you win the game and having more cards in hand represents a more distressed state. 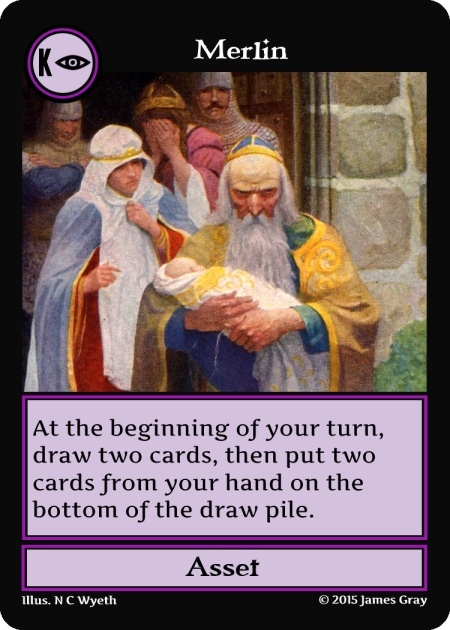 The same card idea was originally used for the Fountain of Youth. Excalibur is the magic sword King Arthur was given by the Lady of the Lake (and/or the sword he removed from the stone). 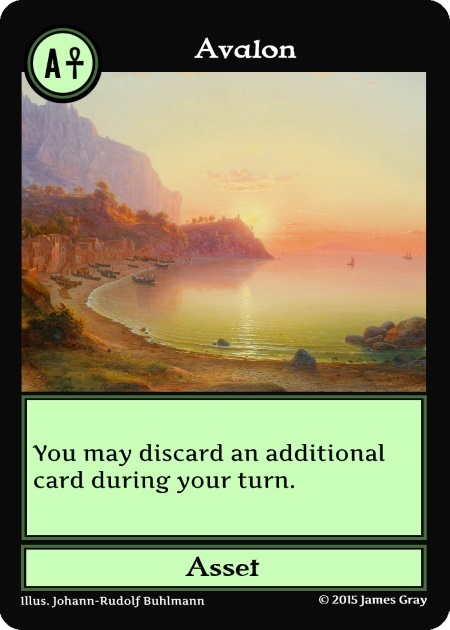 This is one of the completely new cards added to the set. 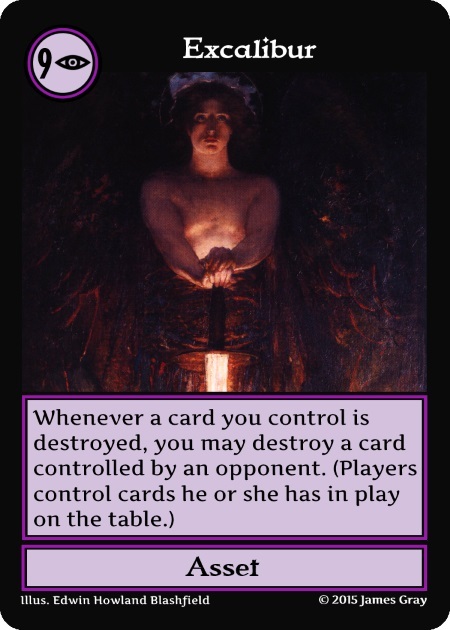 I have to take some creative liberty with how that can translate to an ability in Crazier Eights, but the main idea is that you can use the sword to take vengeance. There is a sense of justice involved with the sword since you can’t just use it to destroy things without any provocation. 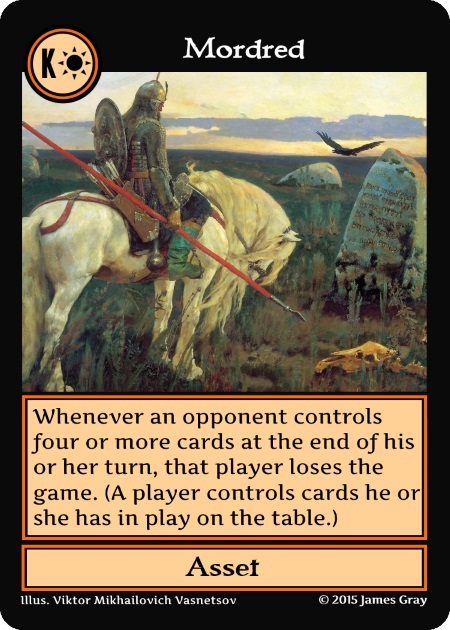 Holy Grail was already in the set, but I decided it should be increased in power because the quest for the Holy Grail was the greatest question in the Arthurian stories. The Holy Grail has the power to heal, which is represented on the card in two different ways. One, it can prevent things from being destroyed. Two, it helps you discard extra cards. 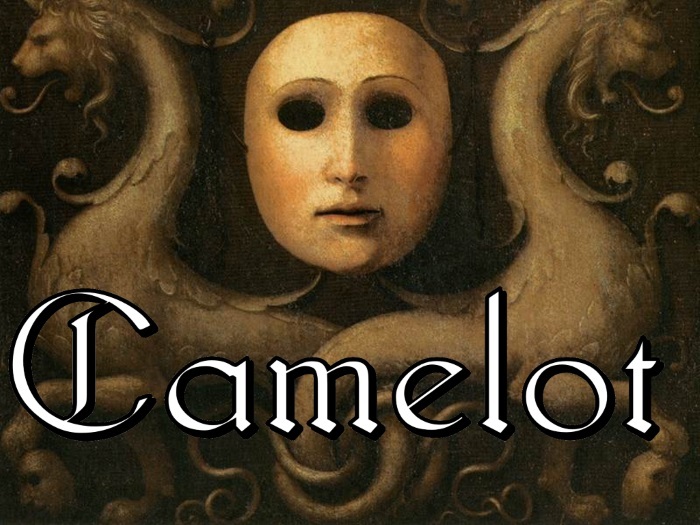 This entry was posted in crazier eights and tagged camelot, king arthur, second edition. Bookmark the permalink.